Just go with me on this little journey. In my mind I have been thinking about all of my product, user experience and development friends. I wanted to try and provide some ammunition to a group of you who are still working in an environment that will not allow you to break free of old stodgy ways of working and work in way that will free teams to explore the new world of how Product Experience Teams (PXT) work and solve problems together. It still comes back to a philosophical difference at the leadership team level. Either you believe product is simply a hired gun to execute the leadership team’s vision and to be told what to do and how to do it. It then pours down those execution ideals to development teams and other parts of the organization to implement. You empower, trust and confide in the product organization to drive the company’s product strategy, execution and potential re-shaping of the company’s vision. Remember, vision can still come from the top but like I have always said teams own and lead the implementation of the ideas. As leaders we need to be open to how that could re-shape our first impression of what the vision was. You build teams to get as close to the customer as possible. (I call these listening teams) Teams bring together and involve the entire company in that tribal knowledge and findings from those efforts. But the most important part to get right is the user breaks the tie. We need to shelve our personal bias, eliminate unilateral decision making power over features and experiences and let the user and their repeatable data teach teams how they use your product. I refer to this as a Product Experience Team (PXT) Ok, what’s this all about.For starters, please stop building teams around features. Build teams around experiences. Sure we have features in there but that’s why we keep building crappy products because we focus solely on the feature not the experience- journey the user takes through a product. Just to be clear, in the below diagram you can place a persona, experience or a big idea in the middle. All of the practitioners clan up and work to find common ground and glean confidence by working together, having healthy conflict and solving complex human centered product problems together. If I where to describe what my teams do everyday I would say 85% of their time is discovery driven. We focus on the experience of the product and the direction it should take. The title we use to describe these individuals is a Product Experience Manager or PXM for short. As for the other 15% I would say that most of this is organizing, communicating, and collaborating with different parts of the organization to inform them on what’s happening when. A little project managerish if I am being honest, but I hate to say those words. Nothing against project management. I just don’t see it as necessary if you are building these types of teams. DISCOVERY DRIVEN: What does discovery driven mean? It is the study and practice of ethnographic techniques, combing over qualitative data from prototype observation interviews, aggregating qualitative responses from voice of customer sessions to define the next path forward and a deep review of quantitative data sets once the product has hit the streets at scale.This does not replace User Experience Design which embodies much different techniques but instead couples itself even tighter to the task flow diagrams, journey maps, hot spots drills and user story mapping practices.This also includes our development teams at a very significant level. We don’t think of development and product as a different group sitting on the opposite side of an aisle. Developers are all part of the ethnographic research with PXM and UX design in daily work. They are the technical side of the conversation and thinking we bring to building a product. This can all work in matrix organizations or can report into one leader be it the CTO or CPO. The point is, they are one experience team. We have nine of these teams all cross-functional, co-located. Below is an example of what this actually looks like. The San Diego experience team. Our product experience managers are the catalysts for joining the organizations arms together to understand the human centered connection between our product and the true reality of what is possible. There needs to be a day where we stop aligning teams and organizations around features. Customers have experiences. Sometimes they use features while passing through your experience. It is more important to begin aligning teams around these experiences to fully understand what customers are doing along their journey. If you are in one of these organizations that receive “requirements” from above you in the organization it’s time to sit them down and educate them about the true value a PXT can bring. We will change their vision. We appreciate their ability to explain how they see the execution of that vision but ultimately if we do our jobs right. The user will break the tie regarding what I would mostly quantify as a conjecture. Enjoy what you’ve read? Good, because there’s an entire book full of this stuff. I’ve been working with two masters of product Martin Eriksson and Richard Banfield on writing a book that all product professionals can benefit from. Partly out of curiosity and on the back of our own experience, we’ve interviewed almost one hundred product leaders. Their insights and experiences will open up the conversation and take the lid off the mystery of great product leadership. Are we building a 10,000 square-foot house? I have been obsessing over how to convey how important adding new features to our web-based products lately. What has struck me is that we, product development teams, really have no tangible artifacts to tell the iterative product development story well. In this world of continuous deployment it’s nearly impossible to show the evolution of a product. So, I had the idea to use waybackmachine and grab all the timeline views of Facebook from 2009-2015 so my team could see what decisions the Facebook product development team had made over the course of those years. It is a good object lesson but I was left wanting. This didn’t tell the whole story. We weren't in the kitchen while the meal was being prepared. We were just seeing the final outcome. All we can do is guess what the product team was doing. So I turned to my own experience and found an example of how this played out in a physical product that sheds light on the importance of why we need to be careful about what features we decide to ship. In the Fire and EMS industry, Emergency Medical Technicians (EMT) are faced with a myriad of daily response calls. Many of these calls are in people’s homes. I am asked all of the time what types of calls I responded to and my answer continues to be the same: Healthy people don’t dial 911. The majority of the time it’s a health, motor vehicle or mental health related issue that needs responding to. As the obesity rate has increased in the United States so has the size of the ambulances, ambulance cots, and the number of people needed to move patients in that industry. While I was at Stryker™ we were trying to come up with solutions to solve this problem. One solution that could help EMS professionals with heavier patients. It's tough to tell what makes these first two products different. The first product is a powered ambulance cot. When it launched in 2005 it was a game changer. The second product, for all intents and purposes, resembled a glorified ironing board to lift bariatric or obese patients. The third product is known in the industry as a Shamu. Yes, that's correct it was aptly named after the same sling to move Shamu the killer whale around. Sometimes as EMTs you are placed in situations where you cannot get an ambulance cot close enough to the patient and you need to place the patient in this sling and slide them to a location more open to load them on the cot. So we, as a product development team, set out to see if we could come up with an idea to help the bariatric industry. This may be a little stretch in your mind, but lets try and make it together. I personally am faced with huge feature demands while developing web products. I am sure we can all commiserate together looking at our backlog list for new features that need to ship. Then I had this ah ha! moment. I want these features to have a huge impact on user experience. I asked myself, what level of confidence do I actually have that all of these features are providing value? You may be thinking. "Nate, you just talked about Directed Discovery and how important it is that we do our homework before deciding on what we as a team bite off." I know, I know but, the funnel in which I made my decisions needs a little work. This is me coming to that realization together with you. I want every feature that I add to be a game changer. So in my mind I actually want to cut down the number of features I ship. The reason I am using the ambulance cot analogy is that when I make one subtle change to this cot it provides a lot of impact. For instance, if I change just a simple bolt or fastener from stainless to some other metal, it could have huge impacts on corrosion or life cycle. Does this make sense? As we set out to solve this bariatric issue, we had the same thinking in mind. Small invention or feature could mean big impact! Bariatric cots are manual cots that require lifting every time. We needed a bariatric ambulance to transport the patience because most bariatric cots will not load in existing ambulance cot fasteners. Bariatric ambulance have special crash test standards and special fastener. A lot of smart thinking went into this so we saw a huge opportunity to help the industry if we could come up with a viable solution. Use the power cot platform. We were crazy not to. Eliminate when possible a second crew and second ambulance coming to help. This would reduce the potential of additional back injuries plus the environmental impact, cost of fuel, and cost of the additional workforce. The Whole Point: The whole point of writing this is to tee this section up. We have a platform of patient transport products. We have a user base, we have an opportunity to give our users a new experience through the use of our cot transportation platform. Can we solve this by inventing a new product? or can we add a feature that would provide game changing value? This took the team a lot of cycles to find a solution. Here is the solution. We had some great tools already in place. For instance, the power cot lifts 700lbs. We wanted to take advantage of that. The problem though is the patient surface isn't large enough. This is where the team really honed in. We came up with what is called X.P.S. or Expanded Patient Surface. This included a redesigned patient surface mattress and a newly designed side rail. This allowed us to take advantage of the Power-Pro cot platform. If we did this then we solved the need to eliminate another ambulance on scene, the need for additional personnel on scene, and we knew our existing cot worked on 80% of the ambulances industry world wide. Boom! Something we didn't see coming (but was good): For reference the Power-Pro cot line is 9-years old. I knew that it would impact existing and new cot sales, but I didn't see that by adding a feature it would surpass all bariatric cot sales combined in one year. Then pull Power-Pro sales into high double digit growth category year-over-year. I left Stryker before I was able to see all the impacts but have stayed close to the team. From what I hear, it has been a game changing add to the patient transport platform. Wrapping back around: We are faced with a lot of decisions on a daily basis. The hope here is to challenge you to look at your daily work. Look at the features and new ideas you are working on and ask yourself. "Are we building a 10,000 square foot house?" and filling it with things we kind of care about or are we fighting over every piece of furniture that goes in. My humble opinion is the size of the house is meaningless. We have to fight over every piece that goes in. It matters! 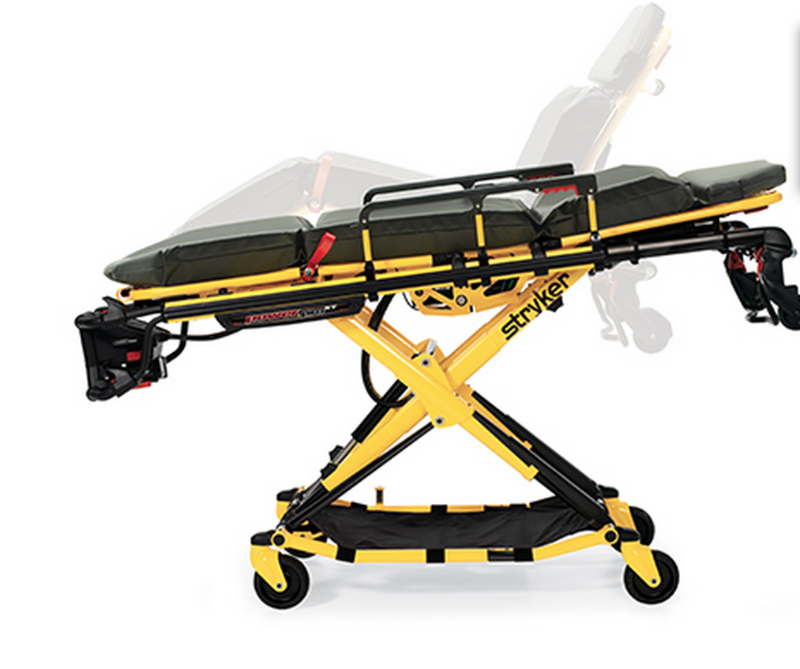 We should be shortening the feature list because like this ambulance cot. It doesn't take much to change the eco-system for better or worse. I would ask that you print out your entire app experience or at least go through each global navigation item step-by-step and see if that is providing the best user experience. Where are the hot spots? What can we remove? Where can we make a difference? Are we fighting over the best ideas or personal wants and desires. We could of just as easily invented some new whiz bang product but by stepping back and leveraging what we already had in place is was very impactful in a very short period of time. Good luck next week! Let me know how it plays out and if this has helped. I love hearing your stories. It’s no secret that wearable technology has become a hot trend in the recent years. Devices that track health and fitness range from simple pedometers to wristbands and necklace pendants that monitor the amount of calories burned and record movement and even sleep patterns. These gadgets make it easier for individuals to get a picture of their overall health and fitness so they can stick with plans to live more healthy lifestyles. Not surprisingly, this automated hands-free approach to wellbeing is also taking off in the corporate world. A growing number of organizations are implementing well-being programs that leverage wearables by providing employees devices that capture data on overall health. Managers are learning more about how their employees’ behaviors and health choices are impacting their wellbeing, and consequently, their work performance. Wellness programs involving the use of wearable technology have led to happier, healthier workplaces where employees are motivated to be more productive and engaged. They have also caused a shift in workplace culture and focused conversation onto health and wellness. There have been many studies conducted on the impact of wearable devices on well-being program participation rates and results. The Vitality Group, a large incentive- based wellness program, conducted a three-year analysis of the prevalence of wearable devices in the workplace and their overall impact on employee health. The research revealed pedometer use greatly increased and was popular with an older demographic. Participants of the study who were not previously active reduced their health risk factors by 13 percent, and previously active participants reduced their factors by 22 percent. Employees earned points for being active, sticking to their programs, and meeting goals. They were then able to redeem these points for rewards in an online mall. Results from other voluntary corporate fitness programs involving wearable technology were revealed at the two-day Digital Health Summit earlier this year. Experts shared that participation rates topped 80 percent, there was a 600 percent increase in weight loss, and 12 percent fewer heart attacks. One study also found that fitness levels increase by 43 percent if a participant is just wearing an activity monitor, no matter what the program requires. According to Tom Rath’s best-selling book, Eat Move Sleep, the workforce has become too sedentary. On average, Americans now spend more time sitting down (9.3 hours) than sleeping in a given day. And, research consulting firm Gallup estimates that disengaged employees cost the United States between $450 billion to $550 billion each year in lost productivity. There are many factors that can lead an employee to feel disengaged at the workplace: lack of sleep, a skipped meal, or simply feeling disconnected from their management and co-workers. A healthier lifestyle that includes regular exercise and a stable diet can lead to less sick days, increased focus, and better job performance. The Human Cloud at Work (HCAW) conducted a series of research experiments to study employees’ levels of productivity after weeks of using wearable technology. They found that the use of wearables caused productivity to increase by 8.5 percent and employees’ job satisfaction to also increase by 3.5 percent. Many organizations are recognizing the research findings and implementing different kinds of wellness programs. The programs that are built upon the use of wearable technology provide more concrete data and metrics for employers to use for everything from negotiating insurance premiums to choosing lunchroom menus. There are a variety of wearable devices available on the market and functionalities vary. Some can detect location, temperature, and even mood data in addition to tracking heart rate and the number of steps taken. All of this data can provide employers with a clear picture of their employees’ health and give them ideas on how to modify behavior and lifestyle choices outside of the office to improve performance. The thought of sharing health data with employers makes most people shudder, but the fact is many people simply don’t have the motivation to make healthy lifestyle decisions on their own. Wearables are a great way to motivate people to set healthy lifestyle goals and track their progress with very little effort. For all the good things wearables do, it’s essential that the employee wellness platform interfacing with devices encrypts all data and the employee remains completely anonymous to the administrator. Both criteria are necessary to remain Health Insurance Portability and Accountability Act (HIPAA) compliant. Participation in health and fitness programs is optional, but many employees see their coworkers striving to lead a healthier lifestyle and maybe even working harder at the office, and soon enough they want to give it a try. Many companies are “gamifying” participation by developing competitions within the programs that engage and reward employees for making changes in their lifestyle. Wearable devices provide concrete data for these competitions and can push participants further when they know there is a prize on the line. Contests range from simple step taking competitions, to more complex ones where employees track and share their nutritional intake, heart rates, mood shifts, and sleep patterns. The competition aspect encourages employees to share goals and accomplishments with one another. When enough people within an organization are using wearable technology, a shift in company culture can occur. Striving toward peak health and fitness levels will become a commonality among co-workers, providing them with a new topic of conversation in the office and create a sense of community. Employers will also be able to transform the workplace into an environment that promotes and celebrates employee health and wellness. A program that works well for one company won’t always work well for the next. Some employees are motivated by incentives, while others don’t find it worth it to make lifestyle changes. When businesses consider implementing a wellness program involving wearable devices, they should do some research into what kind of program would work best for their organization rather than choosing the most popular new program. Employees who already own wearables or regularly use other applications to track their fitness and nutrition may be hesitant to change up their routine to fit into a program at work. Every day, more employers exhibit interest in finding new ways to encourage their employees to lead healthy lifestyles. Programs focusing on health and well-being are beginning to thrive in many corporations as a result of the wearable technology craze. These tracking devices make monitoring health and fitness metrics simple and worry free, which appeals to busy workers who want to maintain a healthy lifestyle. The data that they provide is also appealing to employers who want to change up their wellness programs and incentive employees to participate. The results from companies who have integrated wearables into their organization are hard to ignore. The increases in employee productivity, engagement, and job satisfaction are all proof that working toward personal well-being is a win-win for individuals and corporations alike. Nate Walkingshaw is vice president of Tanner Labs and creator of WelbeTM, the first digital corporate health and well-being program that aggregates Real-time Wellness IntelligenceTM and enables companies to measure, influence, and reward employee behavior on a day-to-day basis. Autodesk, a multinational software company, began issuing Fitbit devices as optional extras to their employees in 2011. Over half of the company’s U.S. workforce began using them to track the total amount of steps they took each day, which prompted an overall change in behavior at Autodesk. Once they had a device to count their steps, employees made small lifestyle changes that would push them to be more active and meet fitness goals. Buffer, a San Francisco-based social media startup, provides employees with Jawbone Up devices so they can track their activity, sleep, and amount of calories burned each day. In an effort to create an open environment, Buffer employees are encouraged to share their data, goals, and accomplishments with fellow team members. To ease employees’ hesitation and fears about privacy, company leaders ensure that the collected data is only used to support their culture of self-improvement. After a year with the Jawbone devices, the Buffer team has made strides in regards to fitness, well-being, and openness. Results from voluntary corporate fitness programs involving wearable technology were revealed at the two-day Digital Health Summit earlier this year. Experts shared that participation rates topped 80 percent, there was a 600 percent increase in weight loss, and 12 percent fewer heart attacks. One study also found that fitness levels increase by 43 percent if a participant is just wearing an activity monitor, no matter what the program requires. For the last 15 years I have always been scrutinized for bringing the engineering teams that built the product to tradeshows. Most of this criticism stemmed around the fear that due to the introverted nature of the engineering culture, that engineers are terrible in front of the customer. I can attest that the exact opposite is true. Customers love and appreciate the authenticity of an engineer speaking about the product they love building. Customers can feel their passion but more importantly tradeshows are drowned by the "pitch". Customers see right through the fake, canned, feelings behind a pitch that has been rehearsed. However, this has never been my core motivation for bringing engineers to a tradeshow. At the core, I want engineers to get away from their desks and look into their customers' eyes, show them the product they built and watch how it works. There is nothing more motivating to an engineer than to see their product work well or break in front of an actual customer. When you need your team to dig extra deep they become more driven because they know who they're building for. We always talk about the customer when we're building products but now they get to meet, pitch and discover how customers think in real life. So the next time you get the opportunity bring the engineers, take them with you on as many customer visits as possible. They are the best people to help you solve problems. Yesterday I had a designer come in and say "Nate I don't feel like this is my best work. We have made so many decisions to punt on great designs"
This got me to thinking about the empathic side of design and development. Don't get this confused with the empathetic design process. This approach is being emotionally aware to your design and development team while they are in a sprint. I have created a harsh form in Balsamiq of the development cycle from my perspective. The first column is directed discovery. The second column is the building process. The third column is something called "on-boarding or soft presenting". The fourth is full ship and release to customers. Another example I really like is to envision a home being built. The first stage is architectural drawings (directed discovery), the second is stick framing, sheet rock, paint etc... (the build), third is an agent walking around the home describing important areas to me and my family (on-boarding). What I want to focus on is the second column. There are many trade-off decisions that happen during the building process. This is where most of "are we making the right decisions" conversations start to manifest themselves. Having an open mind and heart to these types of emotions is critical. Our designer is correct to have these thoughts. In fact it inspired the team to have a design review early to gut check many of the decisions we have made. It questions the development team, the product team and pushes the designers to gain perspective over the entire project. What it did for me was remind me that I need to increase the communication and understanding about where the project is today, tomorrow, and why we as a team have made these decisions. Its actually nice when moments like this arise. I get to reflect on the personalities I have on the team and the way others like to be communicated to. Some may need a little more focus time to help understand what this process is all about. Finally, I mentioned daily stand up. Stand up is gathering of sorts around a Kanban board every morning. The entire team is expected to be there to report and the previous days progress. If you have not given this a shot you should. It creates a fun lively environment. What seems to be the biggest benefit of this gathering is not only the Kanban board but it connects the remote or working from home employee's to the development process. If there is a daily scheduled overlap of the team it has strengthened our ability to more effect during work hours. A young emergency medical technician saw a problem in the field in which he worked. He carried enormously large patients up and down stairs. If you consistently do this time and time again, shift after shift, this results in a fatiguing injury to one’s back. The next thing you know…SNAP. Herniated Disk—most likely a career ending injury. So as this young medical technician watched his partners go to light duty or end their fire-fighting and emergency medical careers, he came up with a solution. This solution consisted of a track device that mounted to the bottom of an ambulance cot. This, in effect, assisted medics so that they would no longer need to carry patients down flights of stairs. He did all of the prototyping in an out-of-company atmosphere. Once he had a working prototype that he felt was worthy to show to his co-workers, he felt confident enough to ask for help getting this back-saving tool to market. He had a business plan that was very well executed (This was 1998. Business Model Generation did not exist. He was young, but old school) and was ready for discussions. “Yes” the young EMT answered. “What about the cash investment?” said the young medic. At the end of the day he was correct. PO in hand two months later, 50% of this order was pre-paid in cash. This was the start this company needed. •Five fundraising events that involved close to 30 investors. •Type of fundraising that took place: convertible debentures, common stock, series B, and series A preferred rounds. •Superior financial knowledge. This is a keen understanding of how to leverage an income statement, balance sheet and cash-flow statement. •Monthly financial metrics and goals, quarterly board meetings, and annual shareholders meetings. The point to showing this high-level bulleted list is to share with you that a young entrepreneur needs a team IF your plan is to raise capital and set it up for an exit strategy. Having amazing mentors pulls your mind out of the daily grind. What really hits home is the majority of these endeavors are happening outside of the day-to-day activities. The pressures on a young startup entrepreneur both inside and outside of the company are enormous, especially if you include the company’s performance evolution. If the company is under-performing and you have a supportive board, this can make all the difference. Carrying this on your own and preserving the company culture is hard to do with a supportive board—doing it alone would be very difficult if not impossible in my opinion. If the company is over-performing, this can cause the same challenges. Growing a team, preserving culture, watching costs, and staying in the high margin zone are essential. Having a mentoring group that applies accountability pressure during these times is also vital. I’m sure you may have guessed this by now, but this was a little snippet of my personal story. People can talk about master’s degrees all they want, but nothing replaces real world learning. Without this mentoring team, the company could not be a success. Without the internal team at our place of business, we could have not been a success. It takes an entrepreneur to balance this equation well and make sure that both teams are working together. This takes time to learn. It is an acquired taste. Sometimes it’s bitter and you want to spit it out. The other times it is soooo sweet! The biggest challenge sometimes is not the success of your product but getting your team to take steps at the same time and be on the same page. I felt my team was unbelievable (both internally and externally) at understanding how this goes together. Good luck to you, and I hope that you can create the perfect balance! It’s Time to Have a Baby! Depending on the product, make sure you use a diverse user group to capture results. Parse the data and use this to your advantage. Group results by region, age, gender, etc. Look at globally combined results. Why? All of this assists you in nailing down your direction – should it be a narrow, local/regional play or do we have a global solution. Ideally bring three people to all of your customer visits. You need a moderator, video camera (record everything you can), take notes, and have a prepared survey tool. Remember you cannot be offended. Let them give it to you. Enjoy it! This is why we entrepreneurs exist. We love to see real customers giving real feedback. It’s amazing! Clearly articulate the structure of the meeting. First, is the usability study. You do not tell your audience what the “thing” is. You allow them to fumble their way through it. Hopefully you did a good job on the UX or UI discovery session and they get it right away. Second, is the in-service. You explain what your product is and does. Lastly, is the survey section and open Q&A. The usability study is essential. This is where you watch and hear how your customers interact with your product without YOU leading them to water. This is the meaty section of your customer visit. 90% of your results come from this exercise. During the in-service you get to chest pound if you want. (Being humble is the better approach, even though it kills you to watch them fumble through the usability study.) In my customer visits, I give the background to the product, why it looks or functions the way it does, then ask them why they did what they did. Remember, this exercise is all about them. Time. You should try to keep this exercise to less than 1.5 hours. Your first time around might go either way. In most cases it will error on the super long side. As most of you are familiar with, customers don’t really know what they want. But passively they really do. They tell you what they like and dislike or how they interpolate a function through their facial expressions, body language, and how they physically engage the product. When you get back to the think tank and you read the surveys, read the notes, and watch your video, and this amazing picture begins to unfold. You begin to see a pattern in the way they answered questions or responded in the video. Take these gems and create themes. When a theme is more pronounced, that is what you should pivot toward. Make the needed modifications to your product and then retest to the same group. 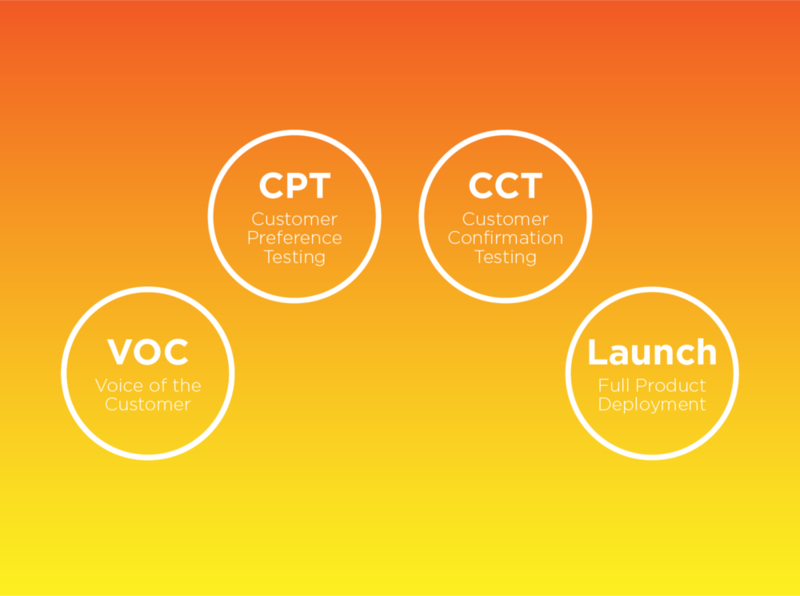 Once you have made the final modification, you should go back to the same user groups for what’s called a customer confirmation test. This verifies that you took what the customer most described as their true wants and corrected the product to their satisfaction. If you have…you are one step closer to delivering your beautiful baby to market! Product development is a deep rooted passion in my life. I am passionate about the creation of anything. Not just physical products, but this is a compulsion around innovative thinking. When I sit back and watch what humans have created it is sweet, but the details of how that happened is what I really get out of it. I think that’s it for me. It’s the hunt. The adventure of creating new. Because along this adventure of creating new, you create more new, or you solve old. Solving old is so good. Sometimes solving old problems is the core reason why we attempt something new. This brings me to the overarching point of wanting to write. I feel like I have solved some big problems with some pretty awesome people. I am proud of the products that have come to market and the difference it has made and lives they have saved. Just as important, well probably more important to me, is what went on behind he scenes. There is this revolution of “Lean Thinking”, “Business Model Generation”, “Four Steps to Product Development” in our culture today. It is fantastic. It has created a huge behavioral change in young and old. The young are really thankful they aren’t writing 50 page static business plans. The old are thankful as well, but more importantly it has been a hall pass on the way you approach new problems in a big organization. Product development is relatively simple in a small start-up. In comparison there are more complicated issues in a larger corporation. Ironically most of those stem from political power struggles within the organization in my experience. When I developed my first product in a small start-up. These concepts and books did not exist. I wrote a static 50 page business plan (I will post this for you all to enjoy) The product was trying to solve a fundamental problem in my field of expertise. So I choose to solve it in my own way, through my own lens. In its simplest for it worked. I built a product that solved the problem. The story is crazy and meant for another post. What I’m trying to really get at is the product was cool but the conversations I had with users while developing was so engaging and exciting to me. Its that anxious feeling your get. Adrenaline running through me. It was addicting to watch people use or talk about this product that we had developed. It was awesome to make changes and show the product after the modifications. People’s eyes and facial expressions. People became elated! But more importantly they became ambassadors of my mission. This is where and interstate started to connect. You develop a product that could be half baked and then you make customer driven product changes and they then market for you. Could this be it. The secret sauce to success. Maybe...just maybe we have cracked the code to customer development.